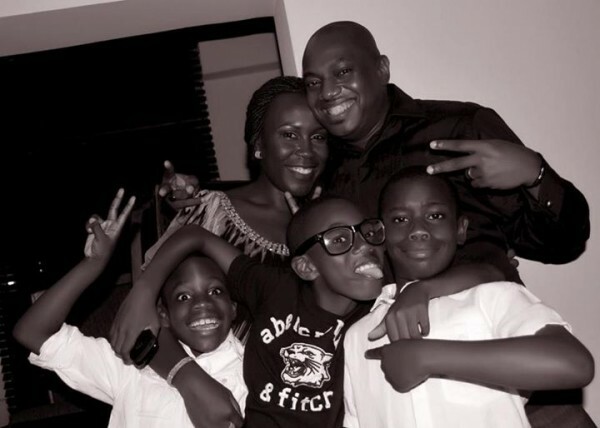 Fela -Tara Durotoye and their three boys. Fela Durotoye was born on May 12, 1971 in Ibadan South West Nigeria. He grew up as the third child in the family to a couple who were university lecturers who later became professors. in Computer Science and Economics (1986-1987) and completed his masters degree in Business Administration and also an M.Phil in Strategic Management. Fela, is an internationally sought-after motivational speaker, a consultant extra ordinance and his passion for Nigeria has earned him the pet name "Mr. Nigeria"
Fela Durotoye is the chief executive officer of Visible Impact, a social enterprise set up to tackle social & environmental challenges & limitations with the aim of building people into super-achievers and responsible leaders, building corporate organization into global market leaders and responsible corporate citizens, as well as assist governments in developing blueprints and program that create a desirable environment for their people to do great things. He is also the Chief Executive Officer of the popular GEMSTONE Group. Gemstone Nation Builders Foundation is committed to nation building and has witnessed an incredible growth in the numbers of Nation Builders Network Chapters and people involved. Currently, over 18,000 people have subscribed to the values that GEMSTONE committed to a new nation. 1. Make a positive impact on everyone I meet and everywhere I go. 2. Be a solution provider and not a part of the problem to be solved. 3. Be a role model worthy of emulation. 4. Be my best in all I do, particularly the things I am naturally good at. 5. Do the right things at all times regardless of who is doing the wrong thing. 6. Value time and make the best use of it. 7. Care and show respect through my words and actions. 8. Consciously build a great legacy starting now, today and everyday. 9. Live a life of integrity and honour. 10. Make my family, my nation and my God proud. gender, age, position and social class. On the 19th of November 2012, he broke world record when he signed and autographed 10,000 copies of the "17 secrets of High flying student" in 8hours 49mins. "Endeavour to build a reputation of expertise". "Don't just be a general practitioner, identify something that you can do better at, grow from being just a pursuer of business to being sought after". He is happily married to Tara; a renowned and celebrated make-up artist and beauty consultant. Together they have three boys who think their dad is a superhero.